This movie was FANTASTIC!!! If you like superheroes, go see it. If you like spy thrillers, go see it. If you like action movies, go see it. Very different, very fun! I do a podcast about Marvel’s Agents of S.H.I.E.L.D. and the Marvel movies called Welcome to Level Seven. We did an episode about Captain America: The Winter Soldier that gets a little more in depth than a comic review can go! 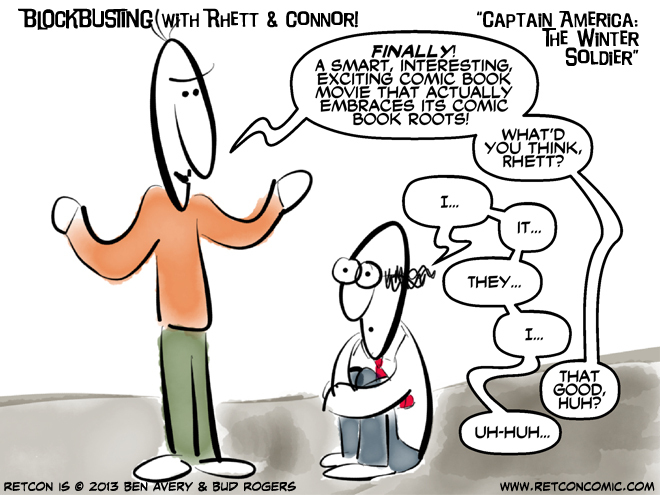 Read more Rhett and Connor movie review comics here!